In 1927, spurred by George S. Parker's infatuation with things Chinese, a new color was added to the Duofold line. "Mandarin Yellow" was supposed to emulate the yellow glaze of imperial ceramics, and was also advertised as "Chinese Yellow"  an appellation for some reason never used by collectors today. The new color was available in all Duofold models, yet it proved unpopular, and would likely have been dropped quickly had it not been the pet idea of the company's founder. As it was, Mandarin Duofolds remained in production as long as the Duofold continued as Parker's flagship line. The yellow Duofold Senior has long enjoyed iconic status among pen collectors, though all of the Mandarin Duofolds are desirable. Uncommon to begin with, their scarcity has been greatly enhanced by their inherent fragility, for the yellow celluloid proved to be far more brittle and prone to staining than other colors. Most surviving pens have cracks in the cap lip, the most vulnerable area. This is primarily a function of age, though it seems the material was vulnerable to staining even when new. It was for that reason that the forepart of the barrel that carried the threads, originally yellow, was soon changed to black celluloid, permanently grafted onto the yellow barrel. In evaluating a Mandarin Duofold, a close inspection of the cap lip area is essential. This should never be done by running a fingernail along the lip, as the material is very brittle and the slightest pressure is likely to cause cracks where none were before. Cracks can readily be seen with a good magnifier, especially with the aid of backlighting. It should also be noted that the Mandarin material often develops internal stress lines akin to the craquelure of some ceramic glazes; these lines are not generally described as cracks, since they are usually shallow and relatively unobtrusive, but they do represent areas of weakness. It is a rare Mandarin Duofold indeed that is without any such stress marks of this kind whatsoever. A relatively common repair for Mandarin Duofolds is cap lip replacement. The seam where the new cap lip is grafted on is hidden under the bottommost cap band, making the repair visible only from the inside of the cap  and often not easy to spot even there. Most Mandarin lip replacements are done using old celluloid taken from off-brand Parker imitations. 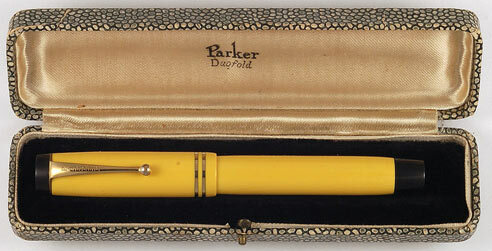 Paradoxically, these contemporary copycats used a yellow celluloid much tougher than Parker's own. Note that some Mandarin Seniors and Juniors are found with extra-wide cap bands that cover the cap lip completely. These bands invariably prove to be recent additions covering lip damage; they are based upon similar bands offered as an option on hard rubber Duofolds, bands which appear to have been discontinued upon Parkers adoption of celluloid. Similarly wide factory bands were, however, commonly applied to pre-streamline celluloid Lady Duofold Deluxe pens in all colors, Mandarin Yellow included. The fragility of original Mandarin Duofolds mandates that they be considered collector's items and not pens for everyday use. Posting the cap, no matter how gently, poses a serious risk of damage and drastic devaluation. That said, it should be noted that the smaller pens are less vulnerable to careless handling, and the Lady Duofold Deluxes with covered cap lips mentioned above are quite resistant to damage from normal use. Larger pens with cap lips replaced with non-Parker celluloid are also able to withstand normal handling far better than a pen that is entirely original.